This is easy to use, easy to apply and okay drying (2-3 minutes). I was quite surprised with this one. I had expected the polish to be much more purple than this! Just look at the bottle shots! I think it is just like a black. It is okay I guess. Lasted well. Thank you for reminding me to this one. It's so gorgeous. I should be wearing it. Black, really, only a small hint of purple. It looks great but not the way I excpected from the look in the bottle. I love black for halloween or rock outfits. Could you tell me if my post is well written in English? Thanks a lot. Thank you!! I should dedicate one day a set or a post to you. Hugs! hmmm.. you know, I really hate it when a polish looks one way in a bottle and then it turns out differently on a nail. This looks totally black!! And this purple shimmer would be spectacular if it actually came out... I"m so disappointed for you!! :'( i love the purple shimmer in the bottle! 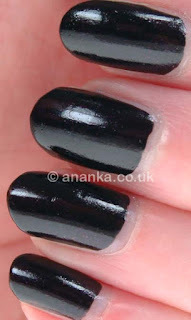 i hate it when polishes end up being darker than they look in the bottle! All the "dark ladies", as I call them, were more black on nails than in the bottle (maybe just the green had more visible shimmer). I didn't mind much, as I love dark polishes, but I understand that being a bummer for someone. I read about a trick (on Pshiiit blog, I think) to make the shimmer more visible: you should use some polish remover to "remove" some polish (a sort of sponging it away), then the shimmer is more visible and you apply a coat of top coat.